I’ve had a couple of busy weeks so far this year attending various events. One such event was Lumiere London which was back for a second year showcasing various light installations across London for 4 days. I went a couple of years ago to the first event that was held in London and when I heard it was back I couldn’t wait to see what was on show this time. I met up with my sister just as it got dark in the early evening at Bond street and found our first piece, which was a see saw that lit up when you rode it. This was actually in London last year and I sadly missed out having a go, so was happy to be able to have a go this time, being the big kid I can be. After the see saws we looked for other light installations in the area and found a neon bike, coloured tube lights covering the front of a building and one of my favourites, coloured umbrellas that people were dancing around with. There were several other pieces too that played music when you struck them or as they came on or off that were interesting too. The next area we went to was Oxford Street up to Piccadilly Circus. There were light shows projected on the buildings that changed with music, which was relaxing to watch and was good for larger groups of people. In this area there were also other pieces, one that I thought that was really fun and sweet was Supercube. It was made up of lots and lots of tiny jars and in the jars were images of tiny women dancing or people making faces coinciding with music. I thought it was really innovative and another of my favourite installations. We then went to Leicester Square which was filled with lots of huge animal shaped paper lanterns that I thought where great. Nearby in Chinatown there were more animals, here there were cheeky flamingos flying around, weaving in and out of people which I thought was brilliant. The final area that we explored was Kings Cross. We first came across huge desk lamps in a row with seating beneath them which made for a great photo backdrops. Further on we entered an area filled with mist and light beams shooting across it. The effect was quite cool and like something out of the Twilight zone. After looking around at the other light pieces on show we headed home, after some 4 hours of walking around London looking at innovative, fun light art, I can honestly say we were exhausted, but it was an engaging evening and I hope they do one again next Winter. My niece has been asking me to take her to London to see the Christmas lights and yesterday I thought I’d show her around. We started at Trafalgar Square to see the fountains, lions, Nelson’s Column and the huge festive tree. After a walk around we went to Leicester Square where there was a Christmas market and we treated ourselves to some sweet mini pancakes. We then walked towards Oxford Street to see the lights there and maybe take a peek at the sales in a few shops, before stopping for a much needed lunch. Carnaby Street was next on out destination, which has some interesting artworks and displays. As it got darker and the lights began to shine we went on to St Christopher’s Place, another little place that’s hidden away. We finished at Marble Arch after a fun but tiring day. My niece said I sounded like a tour guide pointing out landmarks, so hopefully I did a good job. 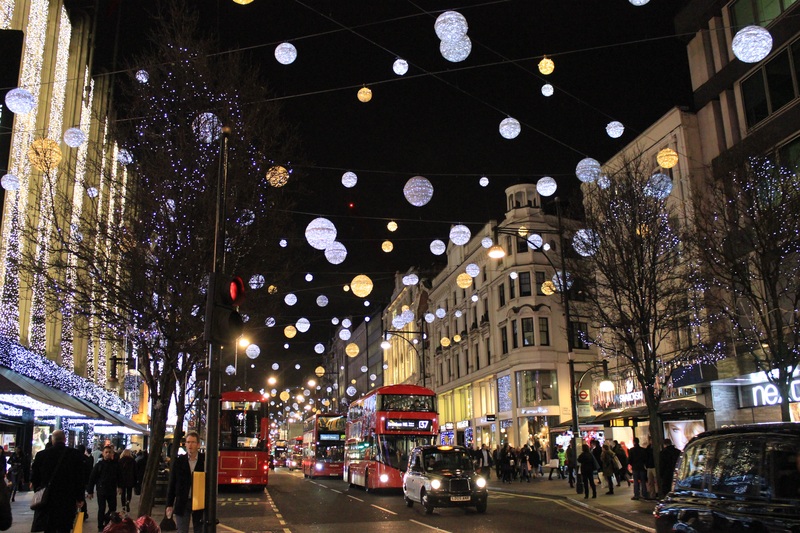 Every Christmas Oxford Street in London is transformed into a wintry scene of sparkly, colourful lights and wonderful shop displays to get everyone in the mood not just for Christmas and the New Year but to give you warm, happy thoughts for the long, cold nights. As kids we were driven around to ooh and ahh over the pretty light displays and I had the same response when I went down over the weekend. There were so many more beautiful shop and street displays to take in which I just didn’t get a chance to take photos of but if you’re ever in London over the festive period I really recommend a walk down this iconic London street to soak in the wintry atmosphere and admire the great light shows.